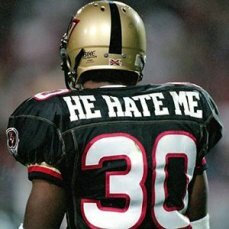 Rod ‘He Hate Me’ Smart of the XFL’s Las Vegas Outlaws. 2017: U.S. President Donald Trump reportedly reveals classified information to Russian foreign minister Sergei Lavrov and ambassador Sergey Kislyak during a meeting in the Oval Office. The information the president disclosed had been relayed by a U.S. partner, who had not given the U.S. permission to share the information with Russia. Officials note that Trump’s action endangers future cooperation from the ally in question, which has access to the inner workings of the Islamic State. 2001: The XFL (Extreme Football League) folds after just one season, the victim of low television ratings, subpar play and inflated expectations. NBC and World Wrestling Federation Entertainment each lose approximately $35 million on the venture. 1996: Eight climbers die on Mount Everest during a storm, at the time the worst loss of life on the mountain on a single day. Author Jon Krakauer writes a best-selling book about the incident, “Into Thin Air,” which is published in 1997. Related Content: Into Sin Air.